Novus Glass Incorporated began more than four decades ago, when Dr. Frank Werner grew frustrated with having to replace his windshield every time he found a small crack. He knew that there had to be a better way, and his work led to a windshield repair system now used by thousands of technicians in dozens of countries around the world. Osland notes that this sustainability ethic is a core component of the Novus corporate culture. For example, Novus has long worked to reclaim, regrind and recycle the disposable plastic nozzles its technicians use to inject repair resin. However, recently, CEO Allan Skidmore sought to raise the bar even higher. He wanted to investigate the possibility of making these injector nozzles out of a biobased plastic that would be more ecofriendly than the current petroleum based resin. Meeting this challenge fell to Director of Manufacturing and Engineering Jon Thomas, whose first concern was to find a biobased material that met the company’s stringent demands for strength and durability. “This needed to be a structural part, and PLAs are not usually known for that type of functionality,” he noted. 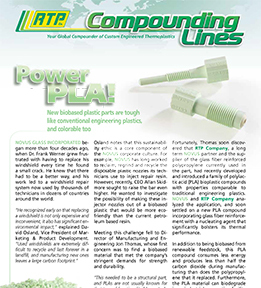 Fortunately, Thomas soon discovered that RTP Company, a long term Novus partner and the supplier of the glass fiber reinforced polypropylene currently used in the part, had recently developed and introduced a family of polylactic acid (PLA) bioplastic compounds. with properties comparable to traditional engineering plastics. Novus and RTP Company analyzed the application, and soon settled on a new PLA compound incorporating glass fiber reinforcement with a nucleating agent that significantly bolsters its thermal performance. In addition to being biobased from renewable feedstock, this PLA compound consumes less energy and produces less than half the carbon dioxide during manufacturing than does the polypropylene that it replaced. Furthermore, the PLA material can biodegrade in an industrial composting facility at the end of its useful life. With the new biobased parts working comparably to the traditional plastic ones, the Novus team decided to market the change by using color. Within a couple of weeks, RTP Company delivered on this challenge, as well.